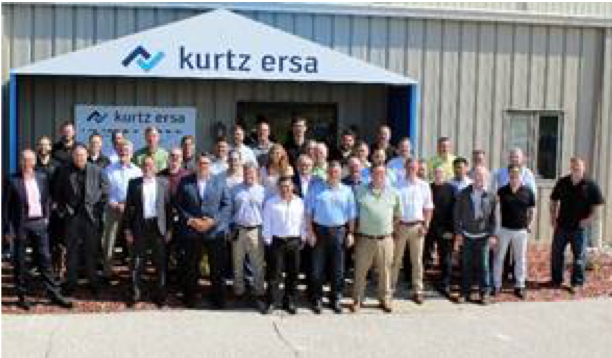 Kurtz Ersa Inc.’s application and demonstration center in Plymouth is ideally equipped for training: in the area of selective soldering with a SMARTFLOW 2020, VERSAFLOW 3/45 and the flagship VERSAFLOW 4/55. The application center has two of the VERSAFLOW 4/55 machines for customer demonstrations, one of which features the extremely flexible VERSAFLEX selective soldering module. In addition, the HOTFLOW 3/20 N2 reflow soldering system, the POWERFLOW wave soldering system and, the most recent addition, the VERSAPRINT 2 Ultra³ stencil printer are available. In the area of tools, Product Manager Todd DeZwarte and his team provided training on the HR 550, HR 600 and IP XL rework systems and the ERSASCOPE systems where the benefits and features of the individual machines and systems were discussed. ‹ Murray Percival Company collects Hanwha Techwin ‘Most Improved rep of the Year’ award.